The star of your garden and your vegetable plot: the aérobêche fork is very useful for airing and breaking the soil and preserving the quality of your earth. Aérobêche forks with 2 to 5 teeth for variable ploughing widths and depending on the size of the digging area. Garden fork with 2 tines. Loosen the soil without turning it over. Comes with 2 wooden handles. 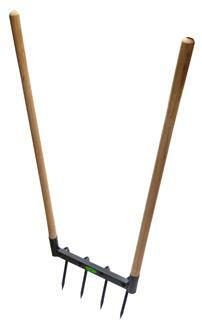 Garden fork with 4 tines. Comes with 2 wooden handles. For 200 to 500 m². Garden fork with 5 tines. Comes with 2 wooden handles. For 500 to 900 m².